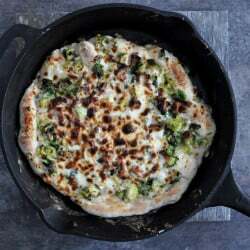 Cast Iron Skillet Brussels Sprouts Bacon Pizza. Oh my gosh. I’ve been waiting forever to tell you about this pizza. And by forever, I mean three days. But in Jessica years? That is forever. The toppings? I’m over the moon. I don’t need to remind you how weird it is that I love brussels sprouts because well, I do that every single time I talk about brussels sprouts and isn’t getting old? Yes and yes. I know. 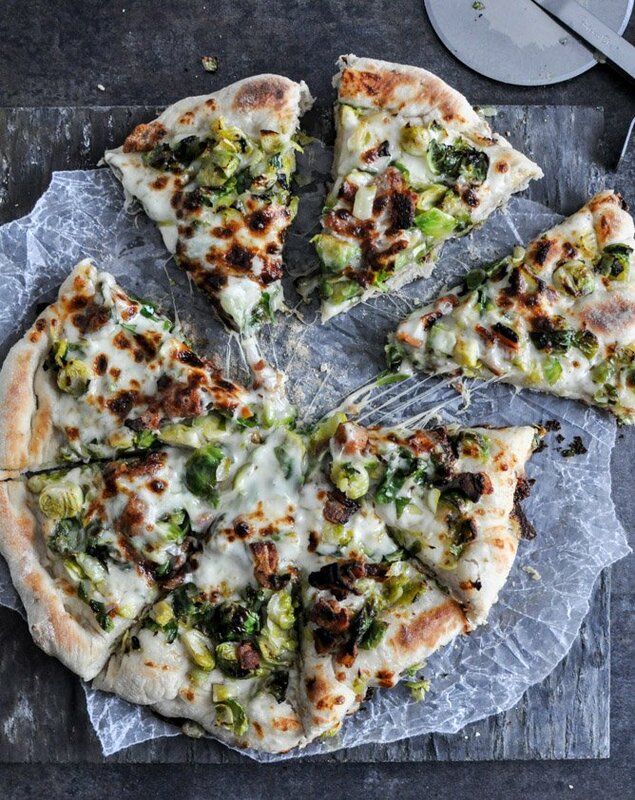 And over half of my recipes with these darn brussels contain bacon, so throwing the whole combo on a pizza was second nature and wow… thank goodness it was. Brussels, bacon and cheese. Just go with it. Also go with a little balsamic glaze if you want. Trust me. What I really have been chomping at the bit to tell you about is THIS CRUST. Not even this crust, but this method. A freaking cast iron skillet, people! This method cooks your pizza in three minutes. No lie. THREE minutes. And it might be the best crust I’ve ever had. At least until I have the next best crust I’ve ever had. I’m no pizza connoisseur – unless eating obnoxious amounts qualifies one as an expert – but this somewhat resembles a wood fire crust or something. I dunno. I might be making that up but it’s what it reminds me of. I used my go-to dough recipe, which is from our favorite garlic bread pizza crust. Since making that nearly one year ago, I’ve never made another dough recipe. Which is huge, considering I try out doughs like they’re going out of style. Back in December, I had to take a little trip to NYC and conned my friend Bev into coming with me. No really, I pretty much verbally harassed her into coming. It was amazing. As we walked the streets of NYC, she told me about how she had made this incredible pizza in a cast iron skillet and how I had to try it. She also watched me emotionally break down when we didn’t make it to Crumbs before leaving for the airport and she essentially saved my life when I tried to jaywalk a few times, but those are stories for another day. Oh! And coincidentally we ate slices of pizza around midnight after already eating a full dinner earlier, but we walked about five miles in between so that more than made up for it. Yeah, we should have had two slices. We inhaled negative calories. Oh. Sidebar. You can make “normal” pizza too. I bet you can’t guess who requested normal pizza. I instagrammed this pizza and said something inappropriate. I swore up and down and right and left that I was making the pizza as soon as I got home. Then I came home and promptly forgot about the pizza because, hello, it was the holidays and I decided to start shopping ten days before. But! Last week I remember and… my world was forever changed. A slight note: um, this method works really well with two people. Additionally, this method pretty much requires a pizza peel. Guess what? I was one person without a pizza peel. In other words, I nearly died while trying to make this pizza. (Note my makeshift “peel” up above, aka a flipped over, floured baking sheet.) I would have been okay with that though because IT’S THAT GOOD. And you know I’ve been trying to reel in the drama recently so if I’m saying it’s that good… it’s that good. I love it. Big heart. In a large bowl, combine water, yeast, honey and olive oil. Mix with a spoon, then let sit until foamy, about 10 minutes. Add in 2 1/2 cups flour and salt, stirring with a spoon until the dough comes together but it still sticky. Using your hands, form the dough into a ball and work in the additional 1/2 cup flour, kneading it on a floured surface for a few minutes. Rub the same bowl with olive oil then place the dough inside, turning to coat. Cover with a towel and place in a warm place to rise for about 1 1/2 hours. After the dough has risen, punch it down and place it back on the floured surface. Sometimes I work in a few more sprinkles of flour if the dough is sticky. This amount of dough yielded 2 pizza crusts for my 12-inch cast iron skillet. If you’re using an 8-inch, you may get 3 doughs, but you also may just want to stick with 2 thicker doughs. Divide the dough evenly in half (or thirds). Place one dough on a well-floured pizza peel and roll into a round about the size of your skillet. Heat a large skillet (preferably NOT the skillet you are going to cook your pizza in) over medium heat and add bacon. Fry until crispy and fat is rendered. Remove crispy bacon with a slotted spoon and place on a paper towel to drain. Remove all but 2 tablespoons of bacon grease from the skillet. Reduce heat to medium-low and add shallot. Cook for 5 minutes until soft, then add garlic, sliced brussels, salt and pepper, stirring well to coat. Cook for 6-8 minutes, tossing occasionally. Remove from heat and set aside. At this point, place an oven rack directly under your broiler and preheat your broiler to the highest setting. Additionally, place your cast iron skillet on the stovetop burner, turning the heat on high. You want to heat the skillet for 10 minutes. If it begins to smoke a lot, you can reduce the heat a bit. But you want it HOT. While the skillet is heating, begin placing your toppings on your dough. Remember, the dough MUST be on a well-floured pizza peel (or surface) so you can simply slide the entire thing into the skillet. Add about 2-3 ounces of cheese to your dough, then cover with the brussels sprouts mixture and the bacon. Top with the remaining fontina, provolone and parmesan. Place a potholder or thick towel on the handle of the skillet (it will be sooo hot). Carefully slide the pizza into the skillet, dough side down. Don’t worry if a few toppings or pieces of cheese slice onto the surface – it will be totally fine. After about 30 seconds, turn off the burner, grab the skillet and pop it in the oven, right under the broiler. Broil for 1 minute, the using the potholder, grab the handle and rotate 180 degrees, broiling for only 1 more minute. Remove immediately and place on the stovetop. Let cool slightly for about 5 minutes, then use a large spatula to remove the pizza. INDULGE! Oh who am I kidding? Drama queen for life. 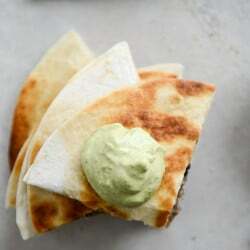 Cheesy Double Bean Quesadillas with Homemade Avocado Ranch. How do you ensure the dough doesn’t stick to the skillet? Word of warning: DO NOT LET YOUR SKILLET GET TOO HOT. I made that mistake and ended up with lovely toppings on a solid black crust. I have a question! How come you have to top the pizza dough then transfer to skillet? Cant you just put the dough in the hot skillet and top away? Made this today, and it was amazing! The toughest part was getting it into the skillet, but once it was there, the flavor and texture was amazing! Love the brussel sprouts as a topping! Winner! Pinned! Not a fan at all. Maybe if the pizza was cooked normally instead of this flash cooked method. The bottom of the crust was very burnt and the top was very soft. I followed the time instructions. The cheese was perfectly cooked, but the crust was terrible. Cook it at 425 for ~15 minutes and you might actually have a good pizza. And that is exactly how I ended up cooking it, and it came out great. I wanted to try it in the cast iron, but I chickened out at the last minute and went conventional in a perforated pizza pan with the oven rack in the lowest position at 425 degrees for about 15 minutes. I, too, am an avid brusssels sprouts fan. When I read this recipe, it was jumped out at me that it was practically identical to my favorite brussels sprouts dish with one exception, blue cheese. My favorite dish is made the same way you prepare the toppings for the pizza but, in the end, the resulting mixture is tossed with blue cheese. I don’t know if you are a blue cheese fan but, if you are, give it a try, you won’t be disappointed. On, and by the way, thanks for this recipe. I have been contemplating building a cast iron pizza for a while, just hadn’t figured out the cooking details. Did you add the blue cheese to the rest of the ingredients or did you use it in place of the other cheeses? I´m so excited to see that I can make a pizza in a skillet! Love it! One of my all time favorite recipes!